It has been a great week for Sussex Cricket, as Chris Jordan stars for England. 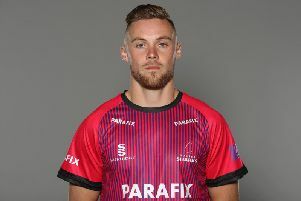 Jordan took six wickets in England’s T20 series win at the West Indies, including taking 4-6 on Friday in their 136-run victory. The 30-year-old will hope to feature for England as they play Pakistan in a one-off T20 game at Cardiff’s Sophia Gardens in May. The Barbados-born all-rounder was due to play for Peshawar Zalmi in the Pakistan Super League. However, his replacement, Tymal Mills impressed in his debut last Tuesday, as the fast bowler took 3-29, against Sussex team-mate, David Wiese’s Lahore Qalandars. Mills’ four-over spell was enough to get Zalmi, who are second in the table, to a three-wicket victory. Zalmi won the toss and elected to bowl first, and restricted the table-topping Qalandars to 124-7, as Haris Sohail top-scored with 43 off 33 balls. In Zalmi’s reply, they got off to a dreadful start, as they were 12-4, but Misbah-ul-Haq’s unbeaten 59 off 55 balls, and Darren Sammy’s 46 off 36 balls, guided them to victory. Wiese took 1-32 off four overs. The 33-year-old South African took 1-44 and scored 12 runs against Phil Salt’s Islamabad United. Islamabad, who are third, won by 49 runs, as Cameron Delport scored an unbeaten 117 off 60 balls, and Asif Ali scored 55 not out off 21 balls. Salt could only manage 10 runs, as United set a target of 239 to win. In the Qalandars’ reply, Akhtar’s scored 75 off 34 balls, but it wasn’t enough to chase the mammoth target down. Laurie Evans hasn’t featured for the Multan Sultans, who are bottom, since scoring one run against Islamabad on February 26.